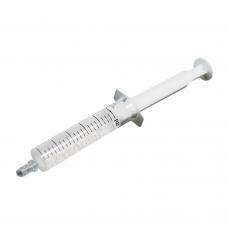 A 10cc 44% hydrogen peroxide teeth whitening gel syringe. The gel is manufactured in the USA and is FDA approved. The gel will help you to whiten your teeth in as little as 1-3 days and can be used with any teeth whitening tray.